In 1092 William Rufus (William II) established a motte and bailey fortress in Carlisle. The castle was strengthened with stone during the reign of Henry I but fell into Scottish hands during the reign of King Stephen. 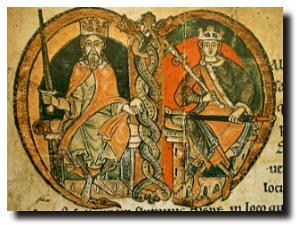 He was somewhat occupied in a nineteen year-long civil war with his cousin the Empress Matilda, the daughter of Henry I and heir nominated by him. These years were the years of the nineteen long winters. King David I of Scotland came into the war on his niece’s side- he knighted Matilda’s son, the future Henry II in Carlisle. The Scots strengthened the city’s defences as well as those of the castle. He died in Carlisle Castle in 1153 and was succeeded by his grandson, Malcolm (known as Malcolm the Maiden), who lacked the strength to hold the Cumbrian and Northumbrian lands that he grandfather had maintained. Scottish claims to the castle didn’t die with David though even though they signed the Treaty of York in 1237 giving up their claims to Cumberland and Northumberland. 1174 William the Lion crossed into England with up to 80,000 men and besieged the castle for three months. Thanks to his grandfather’s building work, the castle remained in English hands. 1216 King Alexander II of Scotland took Carlisle from King John who was having problems with his barons at the time. Upon the accession of Henry III, Alexander gave the castle back once he had been suitably compensated. Carlisle castle has remained in English hands there after with one or two slight hiccoughs. In 1596 Kinmont Willie Armstrong, a notorious border reiver, was rescued by the Bold Buccleuch much to Queen Elizabeth I’s irritation. Following the fall of Carlisle in 1645 after a year-long siege during the English Civil War the city and castle were occupied by a Parliamentarian force led by General Leslie and his Scots.There was also a brief occupation in 1745 by Bonnie Prince Charlie. This entry was posted in Anglo-Scottish history, Border Reivers, Carlisle and tagged Alexander II, Carlisle Castle, David I, General Leslie, Henry I, Henry II, Kinmont Willie, Stephen and Matilda, William Rufus, William the Lion by JuliaH. Bookmark the permalink.